For the hack featuring this character by MKAmeX, see Mr. Needlemouse (hack). "Project Needlemouse" was a codename for the official game Sonic the Hedgehog 4 and independent game developer Defective Studios' Needlemouse: The Emerald Hills. 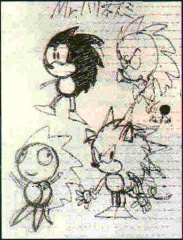 Mr. Needlemouse was a name given to several prototypes of the character Sonic the Hedgehog on an early concept art sheet by his designer Naoto Ohshima. The name is an alternative translation of "Mr. Hedgehog", as needlemouse is a literal translation of the Japanese word for hedgehog (ハリネズミ, harinezumi). For other early concept art and information on the initial development of Sonic and other characters, see Category:Sonic the Hedgehog (16-bit) concept art and Sonic the Hedgehog (16-bit)/Development. One of the more humourous concept drawings (bottom left on the art sheet) of Mr. Needlemouse was implemented in a 2008 sprite hack of the first Sonic the Hedgehog game by MKAmeX, which remains in development, is planned to include a total graphical rehaul based on early concept art, and is documented in the article Mr. Needlemouse (hack). Mr. Needlemouse was later referenced when in 2009 Sega chose "Project Needlemouse" as the official codename for Sonic the Hedgehog 4, likely to accompany their promotion of said game as a classic-styled return to Sonic's roots. Coincidentally, the same codename had been chosen by independent game developers Defective Studios for their game Needlemouse: The Emerald Hills. Their registration of the website needlemouse.com, and displaying concept art for the game there, led some fans to believe that it and Sonic 4 were connected. Defective soon released a statement that this was not the case, and that the similarity was simply a coincidence.